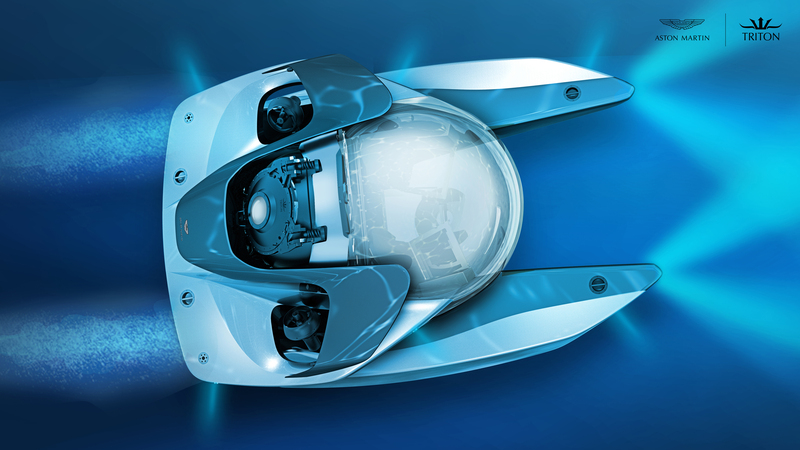 Aston Martin machinery is usually the preserve of 007 himself however, the British manufacturer’s crazy ‘Project Neptune’ collaboration with Triton Submarines has resulted in something that would look more at home in the hands of Bond villain. Actual details on this bespoke submersible are pretty limited but, that doesn’t really matter, as we’re quite happy just to gawk with slightly bemused wonderment at what is possibly the weirdest creation to ever where AM’s winged badge. Obviously, building a fully functioning, three-man luxury submarine is a little different to Aston Martin’s usual day job so, Triton Submarines have lent their underwater expertise to the project. Based out of Vero Beach in Florida, the American company is the most prolific producer of civil submarines in the world. In other words, they know their onions when it comes to building even the craziest underwater devices. Aston Martin (through their new consulting arm) have then used their distinctive design language to create a sleek, elegant exterior that looks unlike anything we’ve ever set eyes on before. The idea is to “grow [Aston Martin] into new aspects of the luxury world”. After all, what do you get the man who has already got a Vulcan and a new DB11 V8 in the garage? A bespoke submarine, of course! What do you make of this crazy Aston Martin submarine? Join the debate over on the Flat-Out Magazine Facebook page now.